William Lewis Sublette was born September 21, 1799, in Stanford, Kentucky to Phillip Allen and Isabella Whitley Sublette. In 1817, the family moved west of the Missouri River and settled in St. Charles, Missouri. William served as the town constable of St. Charles in 1822, and in 1823 he joined the second Ashley Henry Expedition. Going upriver in 1823, the Ashley Expedition was attacked by the Arikara (Rees) Indians near the border between North and South Dakota. The ensuing fiasco between federal troops and the Arikara essentially closed the Missouri River to river traffic. Unable to use the Missouri River, William Ashley dispatched Jedediah Smith, Thomas Fitzpatrick, William Sublette, James Clyman, Thomas Eddie, Edward Rose, Stone, Branch, and two other men whose names have been lost to history overland to the Rocky Mountains. Stopped by snow in the Wind River mountains, the party camped with a band of Crow Indians in the upper Wind River Valley. In February, the Smith party attempted to cross from the Wind River Valley to the head of the Green River Valley, but the snow was too deep over Union Pass. Returning to the Crow camp, warriors told Smith about a broad open pass on the south end of the Wind River Mountains. In March of 1824, Jedediah Smith’s party followed the Sweetwater River over South Pass into the Green River Valley Sis-kee-dee (Prairie Hen River, Fat River). Discovery of South Pass by Robert Stuart and the Astorians in 1812 had been largely forgotten, and Jedediah Smith is credited with the effective discovery of South Pass. Reaching the Green River Valley, Jedediah Smith split the party into two groups with a plan to rendezvous with the Fitzpatrick group on the Sweetwater River in mid-summer. When Fitzpatrick failed to show up on the Sweetwater at the appointed time, Jedediah Smith, William Sublette and four other men trapped toward the northwest. On the Blackfoot River, Smith found an Iroquois trapping party from the Hudson’s Bay Company. 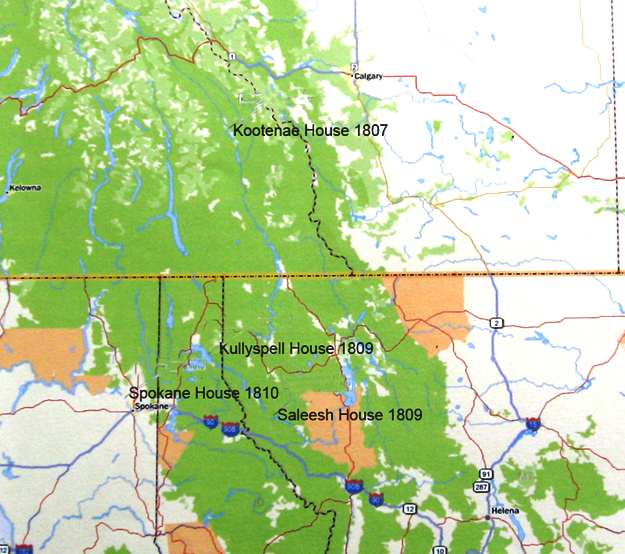 The Iroquois trappers had been attacked by a war party of Shoshone and offered their furs to Smith if he and his men would accompany them to the Flathead Post (Saleesh House) on the Clark Fork River. Flathead Post was eleven miles below Thompson Falls, Montana…between 1807 and 1810 David Thompson of the North West Fur Company had built four posts west of the Continental Divide. In early spring of 1825, the Smith party left the Flathead country to attended the first mountain man rendezvous at Burnt Fork, Wyoming. Prior to the rendezvous, Andrew Henry had decided to leave the fur trade, and Ashley needed a new field partner. During the one day rendezvous, Ashley chose Jedediah Smith to be his new partner. Accompanied by several men, Ashley and Smith took one hundred packs of furs back to St. Louis from the first rendezvous. The 1825-26 winter encampment was in Willow Valley (Cache Valley), but a severe winter forced the trapper to move into the Salt Lake Valley. Two camps were established; one on the mouth of the Weber River, one at the mouth of the Bear River. William Sublette appears to have been in charge of both camps. 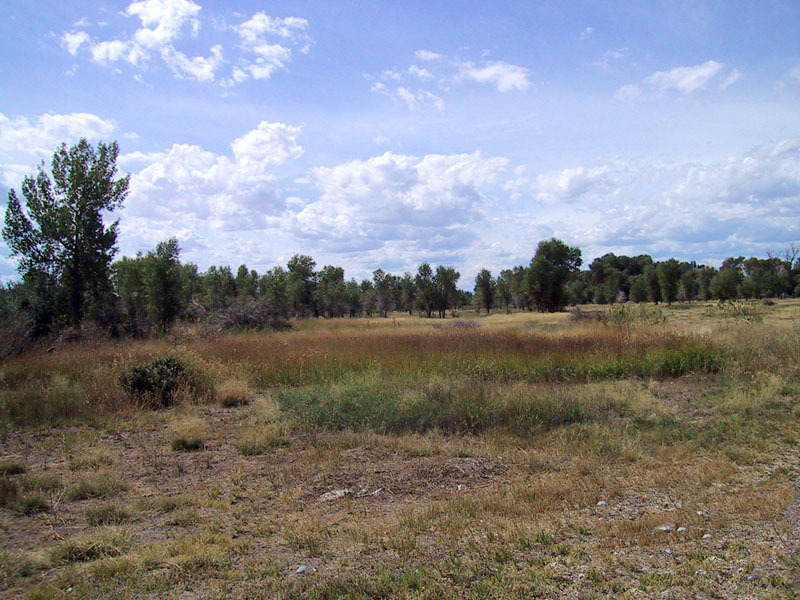 Following the 1826 Willow Valley rendezvous, Jedediah Smith, William L. Sublette, and David E. Jackson met with William Ashley on the Bear River between present-day Georgetown and Soda Springs, Idaho. The new partnership of Smith Jackson & Sublette bought out Ashley’s interests in the Ashley-Smith Company. After three years in the mountains, William Sublette was a partner in the dominate Rocky Mountain fur trade company. Ashley agreed to supply Smith Jackson & Sublette for the 1827 rendezvous provided they let him know what was needed by March 1st…it is interesting to note the new firm had to notify Ashley by March 1st, or Ashley had no obligation to supply the firm. Basically Smith Jackson and Sublette were under no obligation to buy their supplies from Ashley as is often stated in many history books. William Sublette and Moses Black Harris left Willow Valley (Cache Valley) on 1 January, 1927 for St. Louis to arrange for the rendezvous supplies. The cold snow-bound journey was exceedingly difficult and they did not reach St. Louis until March 4, 1827. Despite being three days late, Ashley agreed to furnish a supply train for the 1827 Rendezvous. 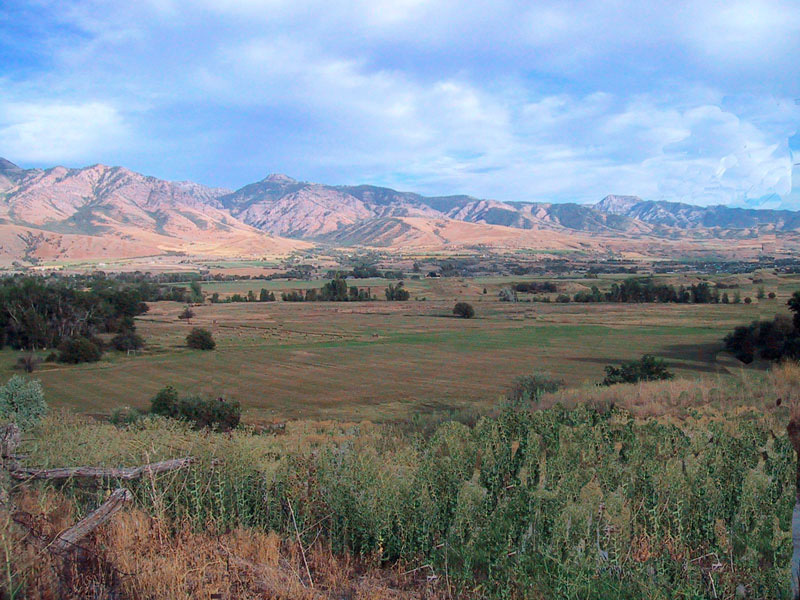 Ashley hired Hyrum Scott and forty-six men to take the 1827 supply caravan to the Sweet Lake (Bear Lake) rendezvous near present-day Laketown, Utah. The supply train with forty-six men and just over $22,000 worth of trade goods left St. Louis on 12 April 1827. The trade goods sent out by Ashley is the first listing of alcohol (Rum) being sent, but there are reports of it at the two previous rendezvous. A small two-wheeled cannon accompanied the caravan. The two-wheeled cannon made the first wheeled tracks over South Pass. On the way back with the furs, Hiram Scott become ill and was abandoned with the promise they would return for him. 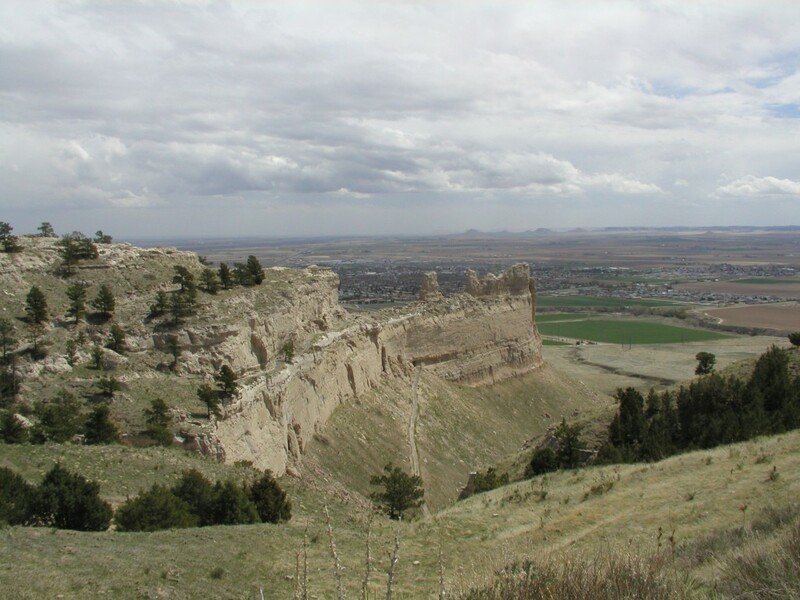 Scott’s body was found three years later near Scotts Bluff, Nebraska. David Jackson and Sublette accompanied the furs back to Lexington, Missouri. In the middle of October, Sublette and Jackson left for the mountains with the 1828 rendezvous supplies. The supplies were bought from Ashley and the Auld Brothers in Lexington, Missouri. Scattered groups of trappers in the valleys along the Green and Bear rivers spent a hard winter and by spring most of the goods for the summer rendezvous were gone, however, this had little effect on the festivities of the 1828 Sweet Lake rendezvous. The Sublette took 70 packs of furs back to St. Louis: 7,710 pounds of beaver, 49 otter skins, 73 muskrat skins and 27 pounds of castoreum. Sublette sold the furs for $35,810.15. After the $20,000 for supplies was deducted, the firm showed a profit of $16,000. 1829 rendezvous on the Popo Agie (Popoasia, Little Wind River) north of Lander, Wyoming was the first rendezvous to be held east of the Continental Divide. There was a small gathering of mountain men on the Popo Agie, and as soon as the trading was concluded, Sublette left with the remaining trade goods to find his partners, Jedediah Smith and David Jackson. 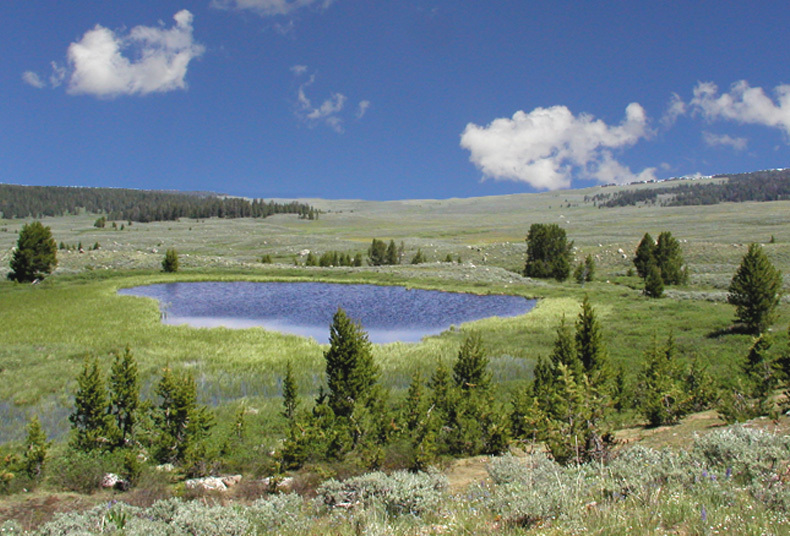 Sublette traveled over Togwotee Pass into Jackson Hole and then over Teton Pass into Pierre’s Hole. There he found Jedediah Smith, who had been in the Oregon Country for two years, and David Jackson. Robert Newell recorded there was one hundred and seventy-five mountain men at this second rendezvous. The 1829 Rendezvous is sometimes referred to as a split rendezvous. The 1830 supply caravan, led by William Sublette, consisted of eighty-one men, ten wagons drawn by five mules each, two Deerborn carriages, twelve head of cattle, and a milk cow. Sublette left St. Louis on April 10th. 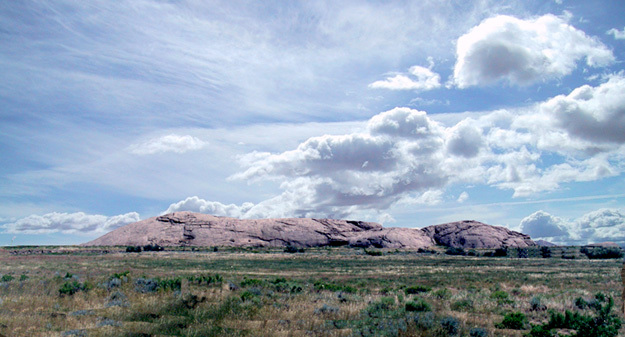 The supply train stopped July 4th, 1830 at a large rock outcropping on the Sweetwater River. Sublette named the rock Independence Rock. 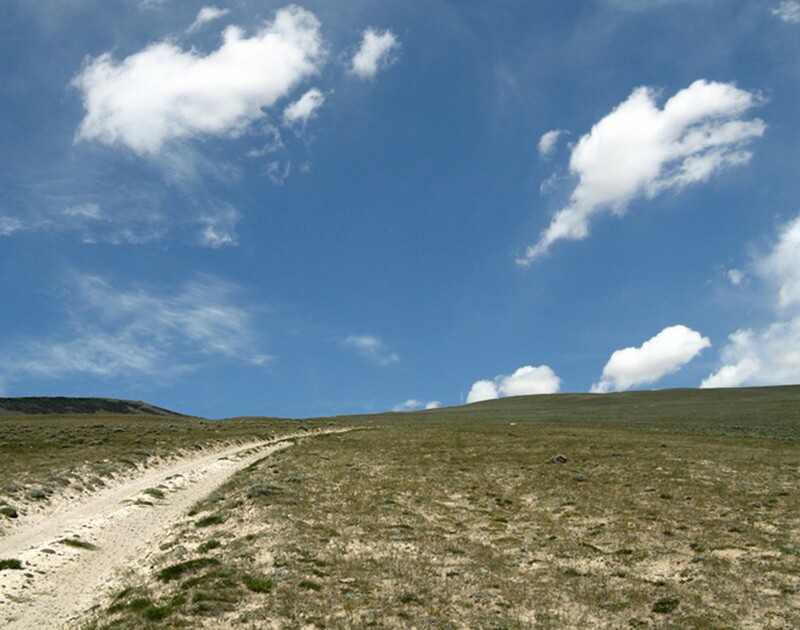 From Independence Rock, Sublette crossed the mountains to the junction of the Popo Agie and Wind rivers, he reached the Wind River Basin on July 16th. Averaging fifteen- to twenty-five miles a day, these were the first wagons to carry supplies to a rendezvous. The Smith Jackson and Sublette firm collected one hundred and seventy packs of furs valued at eighty-four thousand four hundred and ninety-nine dollars. This was the firm’s most profitable year. Despite such a profitable year, the partners had concerns over the future viability of the fur trade. The Smith Jackson & Sublette Company had lost 44 men to Indians, and more than $40,000 in horses and gear had been stolen, plus the demand for beaver pelts was declining. The partners decided it was time to get out of the Rocky Mountain fur trade. Smith Jackson and Sublette sold out to Thomas Fitzpatrick, James Bridger, Milton Sublette, Henry Fraeb, and Jean Gervias on 4 August 1830. The name of the new company was changed to the Rocky Mountain Fur Company. The contract between the two companies stipulated Smith Jackson and Sublette would provide a supply caravan for the new company, however the new company would need to send a representative down from the mountains in the spring to complete the arrangements. Smith, Jackson and Sublette with about 70 men returned to St. Louis with the furs on 10 October, 1830. In the spring of 1831, Thomas Fitzpatrick was late reaching St. Louis. Smith, Jackson, and Sublette were entering the Santa Fe-Taos trade market, but they agreed to supply Fitzpatrick in Taos. With the change in the supply point, the supplies were late in reaching the mountains and there was no general rendezvous in 1831. William Sublette was the main suppliers for the 1832 rendezvous. When William Sublette renewed his fur trade license and posted a bond to not sell whiskey to the Indians, he was allowed four hundred and fifty gallons of whiskey for his boatmen. The route Sublette used to the Pierre’s Hole rendezvous did not require the use of a single boatman. 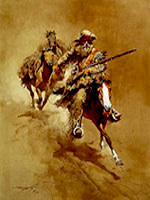 He was accompanied by Robert Campbell who carried a few supplies of his own to the Pierre’s Hole rendezvous. The Pierre’s Hole rendezvous near present-day Driggs, Idaho, is the largest and best documented mountain man gathering in the Rocky Mountains. The Sublette-Campbell supply train was the first to arrive at the Pierre’s Hole rendezvous. Sublette with 450 gallons of whiskey quickly accumulate the furs brought to the rendezvous by the Rocky Mountain Fur Company trappers, free trappers, 120 lodges of Nez Perce, 100 lodges of Flathead, Shoshone, Crow and a few Iroquois and Delaware trappers. The rendezvous began to break up on 17 July. Sublette’s brother Milton led thirteen of his trappers; Nathaniel Wyeth with ten men accompanied him. The first night the combined parties camped about eight miles south of present day Driggs, Idaho. While breaking camp the next morning, a long column of Indians entered the south end of the valley. Two trappers immediately went back to the rendezvous site for help. 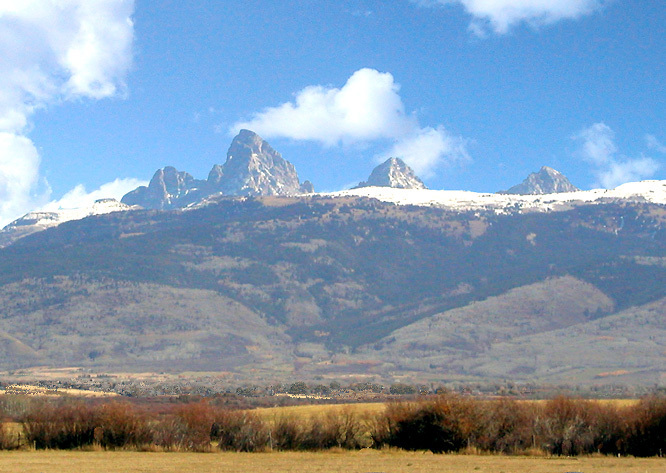 The ensuing battle with the Gros Ventre Indians resulted in the largest battle between Mountain Men and Indians. During the battle, William Sublette was wounded in the shoulder. In the fall of 1832, William L. Sublette and Robert Campbell went to New York City to establish lines of credit with New York mercantile merchants and to meet with Congressman William Ashley on their proposed partnership. Ashley used his credibility as a member of United States House of Representative to arrange lines of credit with eastern merchants. Wolfe, Spies and Clark prominent New York hardware dealers granted them a line of credit with the understanding that Ashley would back them. William Sublette and Robert Campbell signed a formal three year partnership on 20 December 1832. The first order of business was to challenge the American Fur Company’s monopoly of the upper Missouri River fur trade. The new partnership wanted a share of the American Fur Company’s two hundred thousand dollar annual return from the Upper Missouri trade. The newly established firm of Sublette and Campbell was the only fur trading company capable of challenging the older established firm, especially on the upper Missouri River. Sublette and Campbell possessed the expertise, an established line of credit, and the political influence to accomplish this lofty goal. Sublette met Campbell at Lexington, Missouri in early May 1833 with two keelboats. The keelboats contained one hundred kegs of liquor for the 1833 Rendezvous trade. One keelboat was unloaded and the trade goods arranged in packs for the 1833 Horse Creek Rendezvous supply train. Before Campbell left for the rendezvous, Sublette proceeded up the Missouri to erect a fur trading post with a fur trader near each of the American Fur Company posts on the Missouri River. Robert Campbell led the supply train to the 1833 Horse Creek Rendezvous in the Green River Valley of Wyoming. Charles Larpenteur served as clerk for Campbell’s party. Several notables accompanied the supply train including Sir William Drummond Stewart, Benjamin Harrison, Edmund Christy, and Fitzpatrick’s Indian boy Friday. 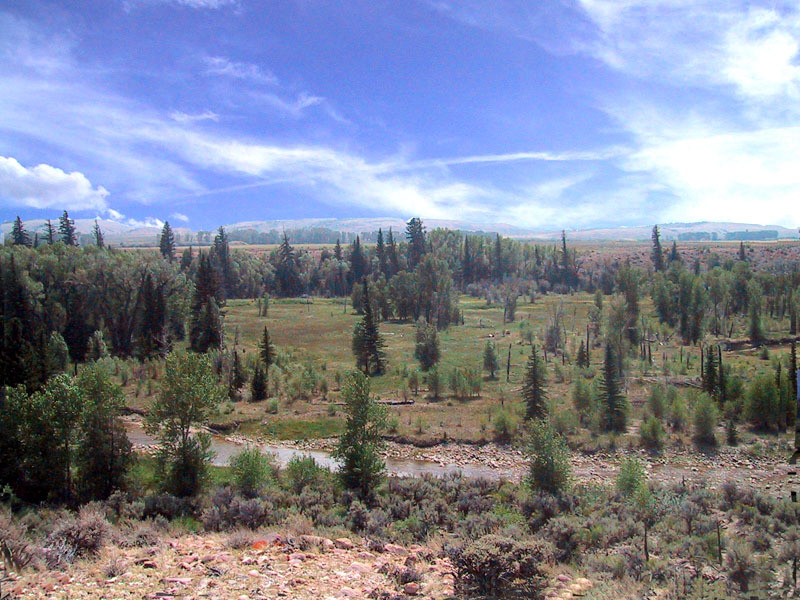 At the close of the rendezvous, Campbell took the pelts to the Bighorn River. Thomas Fitzpatrick, Milton Sublette, and Nathaniel Wyeth accompanied Campbell’s party to the Bighorn country. While on the Big Horn River, Fitzpatrick and Milton Sublette agreed to purchase the 1834 Rendezvous supplies from Nathaniel Wyeth. 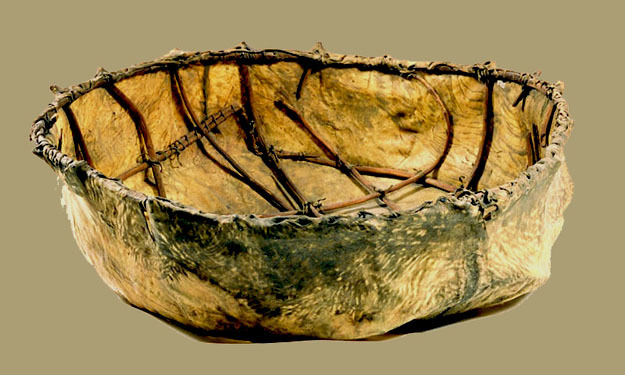 Campbell and his men built bullboats and floated the 1833 furs to a new fort Sublette was building two miles below the junction of the Yellowstone and Missouri rivers. This placed the post about five miles below the American Fur Company’s Fort Union. Campbell arrived at the fort by the end of August, but an ill Sublette had not reached the site until the previous day. Recovered from his illness Sublette left for St. Louis in mid-September. On his way downriver, Sublette visited the twelve fur trading posts that had been erected during the summer of 1833. David Dougherty at the Fort Mandan post expressed an interest in expanding his post to trade for buffalo hides. Sublette immediately sent an express to Campbell to send Dougherty the supplies he required. A key trade item needed to compete against the older established company was alcohol, but on 9 July 1832 Congress prohibited the transportation of liquor into the Indian country under any pretense. This complete ban on the use of liquor in the Indian trade did not deter the American Fur Company’s chief trader at Fort Union. Kenneth McKenzie raised his own corn and built a whiskey still at Fort Union. The only way the firm of Sublette and Campbell could compete for the Missouri River, or Rocky Mountain fur trade, was with alcohol as a trade item. Upon arrival at Fort Leavenworth, William Sublette informed the Indian Agent about the Fort Union still, but the Indian Agent had already been informed of the whiskey still by Michael Cerré and Nathaniel Wyeth. When I reached the mouth of the Yellowstone I found Mr. Sublette there, who had left one of our boats at the mouth of the Sioux, near Fort Pierre, where we had a trading post and also a trading post at the Mandan village. He came up with the other boat to the mouth of the Yellowstone. There was a days difference in our time. We erected a stockade fort, with blockhouses on the angles, the dimensions being 130 by 150 feet. Chouteau and company had a fort above the mouth of the Yellowstone. Our fort was three miles, by land, six by water, distant from it. ….You have never built a fort? Then pray Heaven you never may; for of all the trouble and annoyance I have ever experienced, that gives the most. …You must be aware that I have not been asleep this fall. It has cost me something to secure the Indians to me, but being determined to get the peltries, nothing has been neglected that would carry my point. My opponents cannot by any means get peltries sufficient to pay the wages of their men. At the Gros Ventres and Mandans they have not even enough robes to sleep on. At the Mandans my last account states that Picotte has eighty packs of buffalo robes and eight beaver, and I hope things are equally promising lower down. On my return from Fort Pierre, Mr. Campbell called on me. W. Sublette had previously gone down stream on his way to St. Louis and proposed to sell out to me all their interests on the river. I listened to his terms but was by no means disposed to buy out an opposition, when all my old experienced and faithful clerks and tradesmen felt so certain of driving them out: especially on my giving them carte blanche with respect to trade at their respective posts, of course to be used with discretion but with the condition, that all peltries must be turned over to the A. F. Co. and thus far I have no reason to complain the new company is now in bad odor and must sink. …The Indians, he said, had no confidence in his (Campbell’s) remaining , so that the bulk of the trade went to the big American Fur Company in spite of all we could do… This post (Fort William) was not the only on that was out of luck for those along the Missouri proved a failure. …In no instance have I ever known a settlement conducted with more ability—nor has our friend Mr. Sublette ever shown himself to more advantage than in bring those men to the terms agreed on. It is impossible for me to comprehend the bearings of every question involved—but with regards to the importance of setting at rest all competition (unprofitable to both parties) and receiving payment of useless trumpery I think this compromise if excellent. the enclosed agreement with Mr. Sublette you will see that we have agreed to take the equipment, merchandise, utensils etc. that remain at the posts at the end of the season and we have agreed to stay out of the mountains for one year (Rocky Mountains ). In return for this, Mr. Sublette has agreed to abandoned the Missouri River posts and not to compete with the Company in their stronghold. Kenneth McKenzie’s argument that Sublette and Campbell were finished on the Missouri had gone unheeded by the American Fur Company. A disgruntled McKenzie went to Europe for a month in the summer of 1834. He returned to Fort Union, but shortly left for St. Louis. The fur trade career of the man regarded as “King of the Missouri” was finished. 1) Astor’s retirement from the fur trade in 1834 meant a loss of Astor’s financial backing and his enormously valuable political connections. 2) McKenzie’s still at Fort Union hurt the companies political image in Washington. 3) Sublette & Campbell’s substantial credit line arranged through Congressman Ashley with New York Trading Houses would make it costly to drive them from the Missouri country. 4) Sublette’s financial control over the debt ridden Rocky Mountain Fur Company. …we are looked upon by many as an association determined to engross the trade of the upper Missouri by fair means if we can, but by foul proceedings if nothing short will ensure our object. With such a reputation it becomes us to be more than usually circumspect in all we do. Every eye is upon us, and whoever can will annoy us with all his heart. Within a few days I have had two letters from Mr. Sublette announcing his intention of getting up a small outfit with about 20 men & proceeding direct to the mountains. With knowledge of the arrangement between Fitzpatrick and Wyeth for the 1834 Rendezvous, Sublette assembled a supply train, and after several days passed the slower moving Wyeth train. When Sublette reached Laramie Creek near where it empties into the North Platte River, he left fourteen men to build a fur trade post, which was later purchased by the army and named Fort Laramie. Sublette arrived at the rendezvous on Hams Fork with Fitzpatrick whom he met a few days earlier in the Green River Valley. At the rendezvous site, Fitzpatrick agreed the Rocky Mountain Fur Company would buy its trade goods from Sublette. Whereas a dissolution of partnership having taken place by mutual consent between Thos Fitzpatrick, Milton G. Sublette, John Baptiste [Gervai]t and James Bridger members of the rocky mountain fur company all persons with demands against said company are requested to come forward and receive payment, those indebted to said firm are desired to call & make immediate payment as they are anxious to close the business of the concern. Ham’s Fork June 20th 1834. The public are hereby notified that the business will in the future be conducted by Thos Fitzpatrick, Milton G. Sublette and James Bridger under the style & firm of Fitzpatrick Sublette and Bridger. It is interesting to note neither Milton Sublette nor Jim Bridger were present at the dissolution of the Rocky Mountain Fur Company or the formation of the Fitzpatrick Sublette and Bridger Company. According to Don Berry, William Sublette provided the merchandise for Fraeb’s, and in all probability, Gervias’ shares. The next to leave the company was Edmund Christy. He gave Fitzpatrick a note for two thousand three hundred and fifty-five dollars. Fitzpatrick gave the Christy note to William Sublette. Besides Christy’s note, Sublette received payment for a loan of one thousand two hundred and fifty-five dollars and sixty-six cents from the previous years rendezvous. Despite Fitzpatrick paying the five hundred dollars penalty for not purchasing Wyeth’s supplies, a disgruntled Wyeth took his supplies to the Portneuf River near its junction with Snake River and built Fort Hall. Wyeth subsequently sold Fort Hall to the Hudson’s Bay Company in 1836. Thirty-five packs of furs, one thousand two hundred and fifty-five dollars and sixty-six cents, and Christy’s note did not eradicate the debt owed by the dissolved Rocky Mountain Fur Company to Sublette and Campbell, but it substantially reduced it. This ended the direct involvement of the Sublette and Campbell firm in the Rocky Mountain fur trade. Fontenelle and Fitzpatrick were dependent on Pierre Chouteau of the Western Division of the American Fur Company for the 1835 trade goods, but the American Fur Company had agreed to stay out of the mountains for one year. An agreement between the firm of Fontenelle Fitzpatrick and Sublette and Campbell allowed Fontenelle and Fitzpatrick to buy their supplies from Chouteau. In exchange, Fontenelle and Fitzpatrick agreed to purchase Fort William (Fort Laramie) and to relinquish a percentage of the 1835 profits. The dissolution of the Rocky Mountain Fur Company and Sublette and Campbell leaving the Rocky Mountain fur trade ended an important chapter in United States history. The mountain man’s search for a hairy rodent, Castor canadensis, determined the rivers and pathways of the West. The Rocky Mountain fur trade set the stage for the next important chapter in this country’s history…western expansion. The Sublette article was written by O. Ned Eddins of Afton, Wyoming. Permission is given for material from this site to be used for school research papers. Citation: Eddins, Ned. (article name) Thefurtrapper.com. Afton, Wyoming. 2002. This site is maintained through the sale of my two historical novels. There are no banner adds, no pop up adds, or other advertising, except my books — To keep the site this way, your support is appreciated. To email a comment, a question, or a suggestion click on Mountain Man. To return to the Home Page click on the Fur Trapper logo. Berry, Don. A majority of Scoundrels. Oregon State University Press, Corvallis, Oregon. 2006. Chittenden, Hiram Martin. The American Fur Trade of the Far West. Vol.1. University of Nebraska Press, Lincoln, Nebraska 1986. —–The American Fur Trade of the Far West. Vol.2. University of Nebraska Press, Lincoln, Nebraska 1986. Fayel, William. A Narrative of Colonel Robert Campbell’s Experiences in the Rocky Mountain Fur Trade from 1825 to 1835. Museum of the Mountain Man. http//www.user.xmission.com./~drudy/library.html. Gowans Fred R. Rocky Mountain Rendezvous. Perrigrine Smith Books. Layton, Utah 1985. Hafen, LeRoy R. Mountain Men and Fur Traders of the Far West. Bison Books. University of Nebraska Press. Lincoln, Nebraska. 1982. Hafen, Leroy, Editor. Mountain Man Series. 10 Volumes. Arthur Clark Co. Spokane, Washington. 2000. Hardee, Jim. Pierre’s Hole! The Fur Trade History of Teton Valley. Sublette Historical Society. Pinedale, WY. 2010. Larpenteur, Charles. Forty Years a Fur Trader. Online Edition Mtmen.org. Nestor, William R. The Arikara War: The First Plains Indian War, 1823. Mountain Press Publishing Company, Missoula, Montana. 2001. Sunder, John E. Bill Sublette Mountain Man. University of Oklahoma Press. Norman, Oklahoma. 1973. Wishart, David J. The Fur Trade of the American West 1907‑1840. Bison Books. University of Nebraska Press. Lincoln, Nebraska. 1979. © 2019 The Fur Trade. All Rights Reserved. Hosted by Inflight Creations.